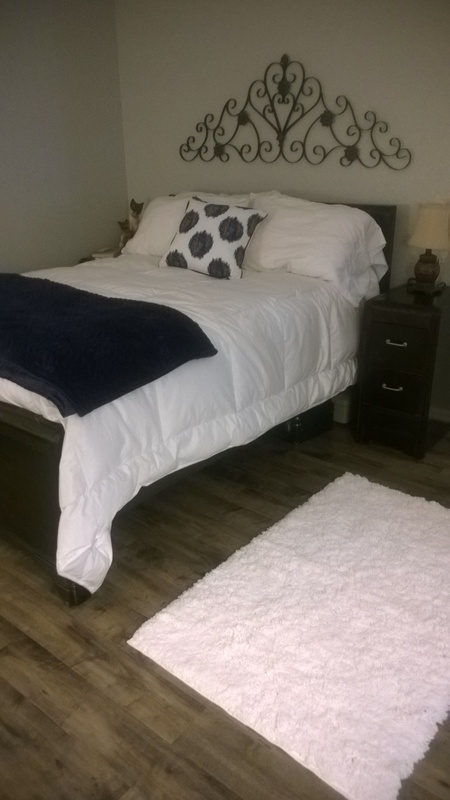 DIY: Creating a Restful Sleeping Chamber … AKA, Damnit, I Broke Another Nail! I’m sure there are certain things you’ve come to expect from Feeding on Folly — simple recipes, tips for living, an occasional jaunt down memory lane … and now we go and offer a DIY project too? Whoa! Don’t get me wrong, the project turned out well, we’re pleased with the result, and our marriage is still intact. That part is fine. But somehow when you reach that mid-century mark, covering yourself in sawdust and plaster just doesn’t hold the same appeal. Fortunately, our bedroom was the last room we had to tackle, and now it is done. When we first bought this home nearly 15 (!) years ago, we had no intention of staying in it very long. It’s a pretty small house by U.S. standards, especially for a family of four. Husband was certain we’d need something bigger, and soon. For me, the home was boring. It is a nondescript tract home, identical to every other home in the neighborhood, completely lacking in character and personality. 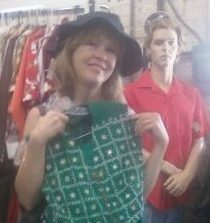 Were our home a high school student, she would eat lunch in the cafeteria by herself, reading a book, pretending she didn’t care that the homes with vaulted ceilings and fireplaces never invite her to sit at their table. So instead we tackled little projects in and around the house, trying to make it more “us.” We built bookshelves, ripped up carpeting, painted, textured, planted trees and flowers, and before we knew what was happening, we found ourselves liking our little awkward, socially inept home. What’s more, we discovered the benefits of living in a small space – the need to make do with what you have, to not fill your life with meaningless objects, and best of all, the smug, self-satisfied feeling you get from knowing you’re smarter than everyone else. I mean, gosh, we’re practically Thoreau for crying out loud! Only without the beans. As you look through these pictures, you’ll notice there’s not a real ‘before’, because when you’re truly embarrassed with your before, you tend not to want a picture of it. It wasn’t until we completely stripped out the room that I remembered I had a blog and maybe I should take a few shots, just in case. Okay, so this is it stripped clear. See what I mean about no personality? Heck, it’s the ladder that gives it interest. We ripped out the old carpeting and padding (definitely wear a dust mask if you do that) down to the concrete floor (yeah, no wood floors for this zip code). 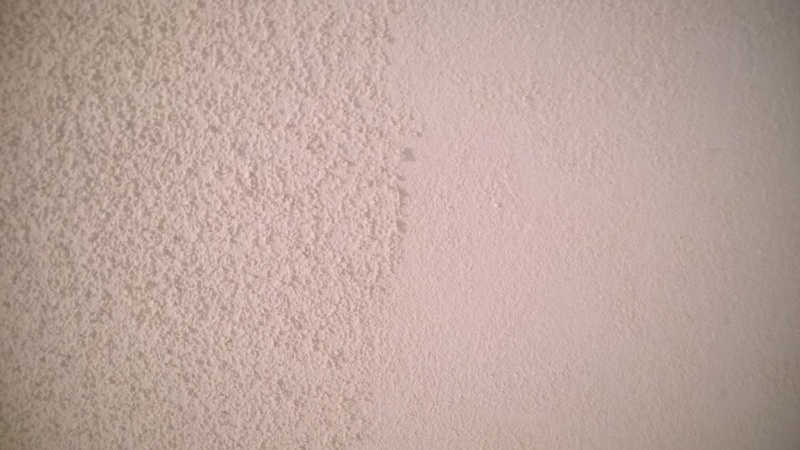 I was about to start painting, then realized this was the last remaining room with popcorn ceiling. I followed this removal process in every other room of our house and I’m hear to tell you, it’s just as messy and icky and exhausting as it sounds. The idea of doing it again filled me with dread, but I knew I’d regret it if I didn’t. Then I had an idea — what if I didn’t wet the ceiling but instead scraped it dry? Just take off the bumpiest parts, leaving a bit of texture, and paint over that? I gave it a go, and it worked! Left side is the popcorn, right side is scraped. I felt it left just enough texture that one coat of paint finished it off well. Also, wear a mask. Like, a really, really good mask. Side benefit: you’ll find out how you’ll look should your hair turn completely white. I, for one, will completely rock it. 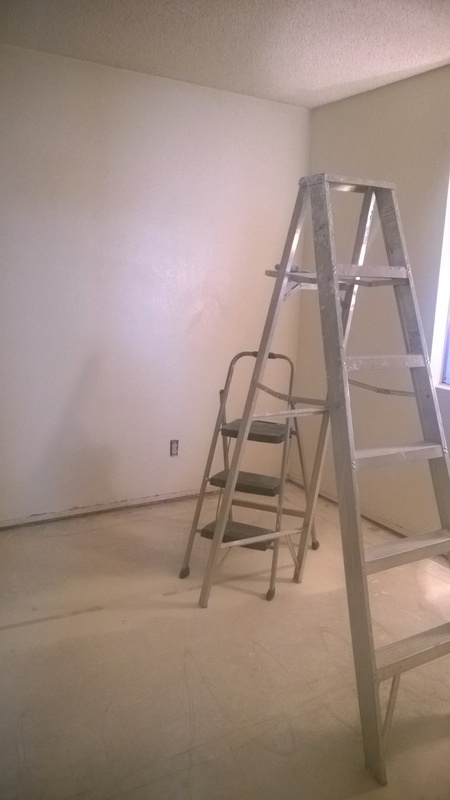 Once the ceiling was scraped and painted, I painted the walls and we moved to the flooring. Please look upon the instructions that came with the wood laminate planks we selected. What sort of company does this? Who prints instructions that small? And why, pray tell, in the list of necessary tools, did it not say magnifying lens to read the damn instructions?! We finally managed to locate one and guess what? 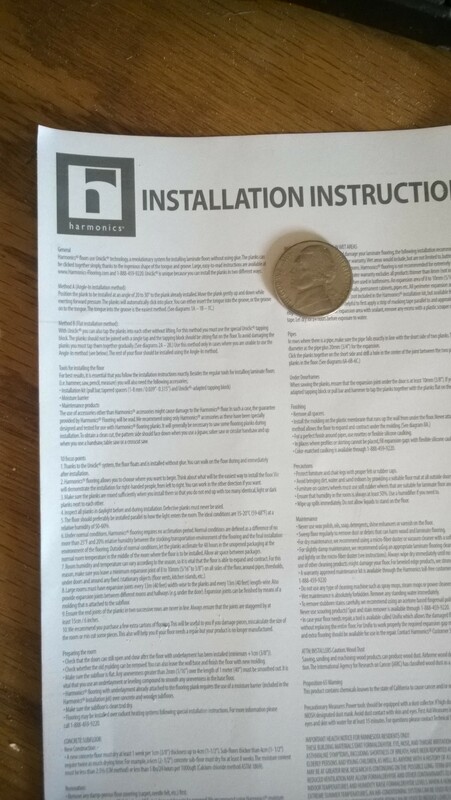 At the end of the instructions, at the VERY end, it said, “For a large print version of these instructions, go to http://www.harmonics-flooring.com. We went to the site and watched the video. A perky woman with a permanent smile on her face assured us it was incredibly simple. “Look easy?” she said with a giggle. “I’d say so!” After struggling with it for several hours, I considered putting out a contract on this woman. Okay, so here’s another tip: If you do decide to put in laminate flooring like this, everything will show you as working from the far end of the room to the other, keeping the new floor in front of you as you go. We found it easier to be on the new floor and work out — keeping our weight on the planks already installed. Make sense? No? Well screw it. Just hire an installer instead. 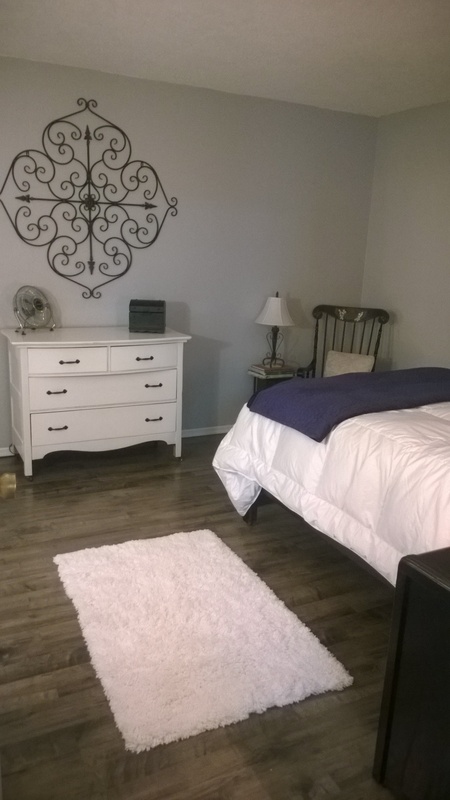 Okay, so the paint and flooring done, I stained the bed frame and nightstands a darker color (Miniwax, color espresso), bought new bedding and voilà — a restful chamber is ours. One of the perks of doing the work yourself is that with the money you save, you can splurge on other things, such as a down comforter and Egyptian cotton sheets. Even so, you’ll note that I am not one for extravagance. I favor a simple Scandinavian aesthetic. Must be the Norwegian in me. After we finished, Husband realized it looked like a room we had at a lodge during a romantic getaway in Colorado. All that was missing was the window looking out to a lake. 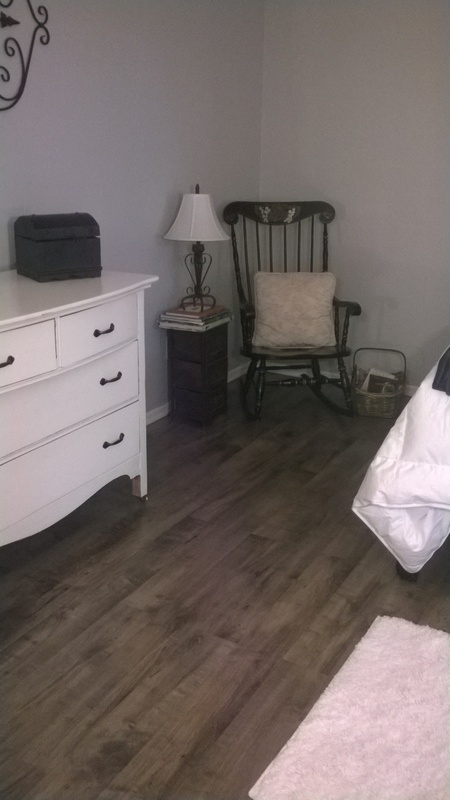 The rocking chair in the corner marks my cozy reading nook, although rocking chairs really aren’t that cozy. It’s only there until I find a comfy chair I love within my budget. Really, every home should have a nook. Nooks are good. Get yourself a nook today. *Upon going to the flooring website, I discovered the instruction video was changed and the perky woman with the perpetual smile was no longer there. Despite what I said earlier, I had nothing to do with her disappearance. You can’t prove a thing. Now, on to the recipe! After a grueling day (or week) working on the house, you need something simple and fast. You might be tempted to hop in the car and grab fast food, but sometimes even fast food isn’t fast enough. Have you ever seen those “Eat This, Not That!” cookbooks, or visited their site? You’ll notice they’re all about weight loss, and normally I would never steer you toward things like that. You look fine, truly you do. But seriously, their recipes are darn good. 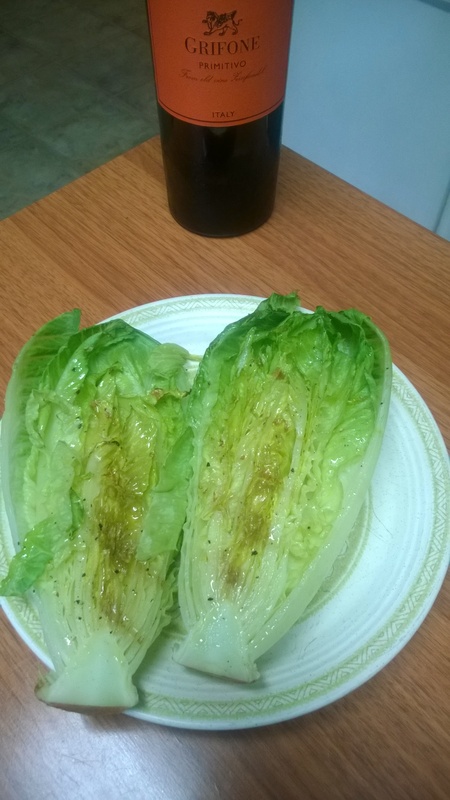 And this one was fun, as I had never grilled lettuce or English muffins before. I mean, grilling lettuce? How cool is that? Preheat the grill. Cut the romaine down the middle lengthwise, leaving the root intact so the leaves hold together. Brush the cut halves with olive oil and salt and pepper. Also brush olive oil on the English muffins. Place lettuce and English muffins on the grill, cook for 1 to 2 minutes, just to lightly char the leaves and make muffins lightly brown and crispy. Cut muffins into bite-size pieces. Arrange lettuce on plates, add chicken, muffin ‘croutons’ and choice of toppings, drizzle with dressing. See what I mean by fast? You’ll have it on the plate before you found your car keys. Fun, and you are far more determined than I would ever be. So, I’d say our determination is pretty well spent! Great job! Looks quite cozy and inviting. Thanks and welcome! Glad to have you here! I love the bedroom, especially the wall art! Job well done! !